PT Saptaindra Sejati - SIS or referred to as "Saptaindra Sejati" is one of the largest mining company in Indonesia. SIS operates primarily as a mining contractors which provides an integrated mining service for leading mining companies in Indonesia with international standard. Its business include exploration and drill through mining contract and logistic support. Headquartered in Jakarta, Saptaindra Sejati is a mining services subsidiary company of PT Adaro Energy Tbk (ADARO Group), one of the largest public-listed mining groups in Indonesia. As of December 2015, Adaro Group holds 100% ownership of Saptaindra Sejati’s shares. In term of financial performance, the Company reported total revenue of US$ 432.6 million in 2015 or down 11.06% from US$ 486.4 million in the previous year. 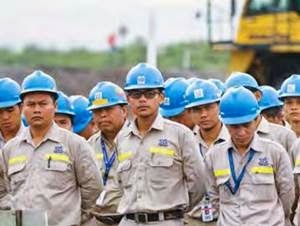 Total assets of Saptaindra Sejati decreased 21.6% from US$ 560 million in 2014 to US$ 439 million in 2015, according to PT Adaro Energy Tbk Annual Report 2015 as cited by JobsCDC.com. Background in Diploma / Bachelor Degree (D3/S1) in Mining. Minimum 2 - 4 years of experience as Mine Engineer in the area of mining industry. Proven skills in Mine Scheduling tools utilizing software such as Mindscape and Xpac is preferred. Strongs ense of analytical thinking and focus on detail. Willing to be based in all over SIS site project. Background in Bachelor Degree (S1) in Mining Engineering, Geology, Geodesy, Industrial Engineering. Minimum 2 - 3 years of experience as a Mine Planner, or a Mine Surveyor/Pit Controller or a Project Controller Group Leader/Jr. Manager/Supervisor in the area of mining industry. Possess POP License is preferred. Proven skills in Mine Scheduling tools utilizing software such as Minescape and Xpac and Theodolit and GPS for Mine Survey is preferred. Background in Bachelor Degree (S1) in Mining. Minimum 2 - 3 years of experience as a Mine Engineer in the area of mining industry. Proven skills in Mine Scheduling tools utilizing software such as Mine Scheduling tools utilizing software such as Mindscape and Xpac is preferred. Background in Bachelor Degree (S1) in Mining or Geologist with Class II Blaster Certificate. Minimum 2 years of experience in drilling and blasting. Good communication skills in English and Bahasa (written and verbal). Expertise with applications of drill blast design and shot plus software. Familiar with designing drill and blast, leading the team and explosives handling. Background in Diploma / Bachelor Degree (D3/S1) in related field. Minimum 2-3 years experience as a Group Leader in open pit coal mining area. Possess certification in second class blasting and POP License. Expertise with Safety, Health, Environment and Quality for SHEQ. JobsCDC.com now available on android device. Download now on Google Play here. Please be aware of recruitment fraud. The entire stage of this selection process is free of charge. PT Saptaindra Sejati - D3, S1 Mine Planner, Group Leader SIS Adaro Group October 2016 will never ask for fees or upfront payments for any purposes during the recruitment process such as transportation and accommodation.